Our snow is starting to melt and there may be a touch of green showing. The All Abloom Designer Paper Stack is full of spring flowers and is a Weekly Deal. For just $5.21, you can make a ton of projects. 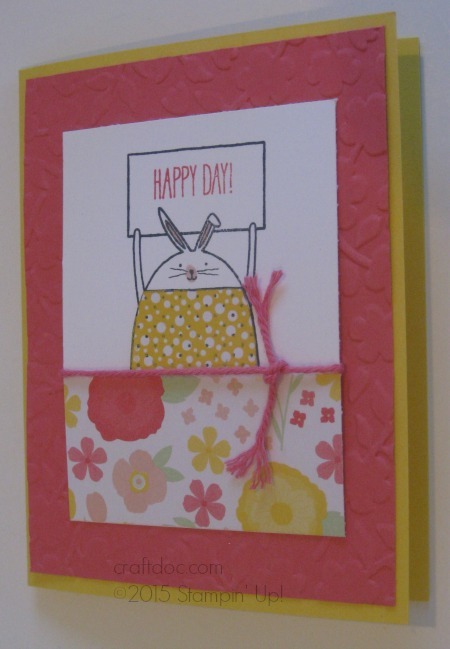 Here is a card for my next class using the Cheerful Critters stamp set. -Cut a 1-1/2″ strip off the bottom of the paper and trim to 3″. Use the scrap to stamp the image a second time for Paper Piecing the outfit. – Use the Spring Flowers Embossing Folder (here) or the Weekly Deal Wildflower Meadow to add texture to the Strawberry Slush panel. 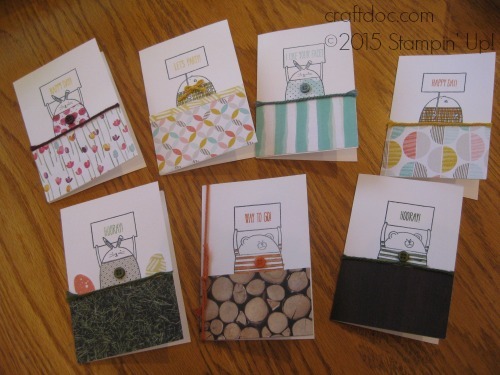 -The second photo shows an even easier layout using the Note card and Envelopes and the new SAB freebie – In Color Accessory pack of twine and buttons. I used some different papers here – Painted Blooms, Best Year Ever and Adventure Bound.